Beautiful newly constructed lodge home on 200 mountainside acres; 10 minutes outside Bozeman Gorgeous views of the valley below and Douglas Fir/Aspen forest Lots of room to hike and explore including ½ mile of Rocky Creek; a special treat for fly anglers Located on a conservation easement, providing excellent wildlife viewing for deer, elk, moose, bear and bald eagles Comfortably accommodates 16 guests; ideal for a family or multifamily gathering Brief Description: Designed in the Arts and Crafts style of the early 1900s, this authentic log and timber home is filled with Mission antique and reproduction furniture, wood floors, rugs and original artwork. 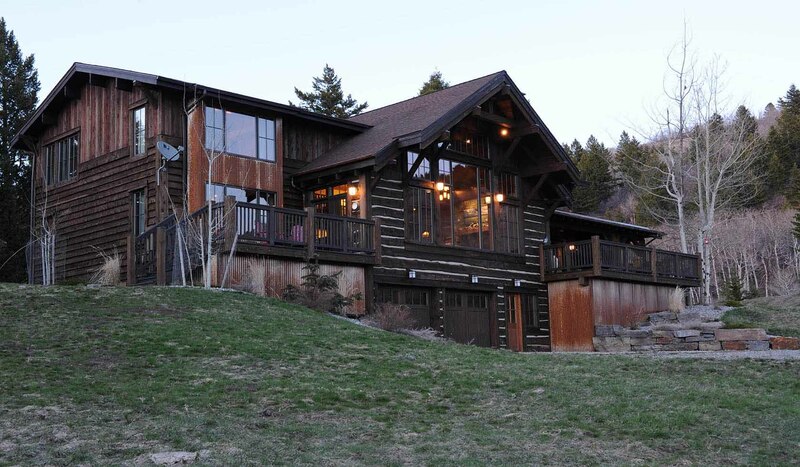 The home has 5,500 sq ft of indoor living space, plus two outdoor decks. From the main deck you'll have great views of the surrounding mountains while dining, enjoying the weather or a fire in the stone fireplace. You'll enjoy a spacious main living area, a 2nd family room and many unique features. Bedrooms and baths: The home has five bedrooms; each with a different theme. It's a great bed configuration for families. The 1st Master Bedroom (Moose) has a queen bed and bathroom with double sinks, custom cabinets, granite countertops and travertine double shower. Upstairs there are 2 bedrooms (Fish Bed and Caribou), each with a queen bed. These share a bathroom with a tub/shower combo. Also on this floor, the 2nd Master Bedroom (Glacier National Park) has 2 queen beds and bathroom, with shower, double sinks, custom cabinets and granite countertops. The final bedroom (the Bunk Room) is located on the bottom floor and has 3 custom-crafted bunk bed sets, each with a double bottom bed and twin top. It's a fun room with plenty of space for kids to play. Kitchen and Laundry: The fully equipped Kitchen has custom Shaker cabinets, apron sink, granite countertops and Thermador integrated appliances. A spacious island with additional trough prep sink, seats 4. The Kitchen features a large walk-in pantry, double convection ovens, warming oven, ice machine, wine fridge, microwave and 5-burner gas cooktop. A cozy Sitting Room by the Kitchen is a great place to enjoy breakfast, catch the news or enjoy a movie. A bar opens into the Kitchen, seating 3 and nearby dining table seats 8. There's a BBQ and plenty of seating outside for grilling and dining. The Laundry room features a 2nd frig/freezer and High-Efficiency washer and dryer. Great Room, Family Room, & Loft: The Great Room has an amazing wall of windows looking out on the valley. There's a vaulted ceiling, massive stone wood burning fireplace, and comfortable seating for a crowd. The lower level has a Family Room with a 52' flat screen TV, 5.1 Surround Sound, and large Blu-Ray collection. Another gathering spot is a Loft between the upstairs bedrooms; a space for reading with an antique roll top desk, books, sporting décor and memorabilia. Other Amenities: A room just off the Family Room offers a delightful surprise - a 16 ft. competition shuffleboard table! There's also a garage Ping-Pong table and other fun games for the family. Setting, acreage, views: This lodge is situated on a conservation easement of 200 gorgeous acres where you'll have opportunities to see deer, elk, eagles, moose and the occasional bear. Enjoy a mountainside morning walk with breathtaking views and fresh air. The highlight is a huge deck with an outdoor fireplace. From this vantage point you're looking at the majestic Gallatin Range where you'll enjoy some amazing sunsets by the fire. Activities Nearby: There's hiking, biking, golf, fishing, skiing and whitewater rafting nearby. Enjoy Bozeman's historic downtown or a trip to the fun western town of Livingston. Tour Yellowstone National Park, just an hour away, with our sister company, Greater Yellowstone Guides. Or explore an old mining town, Virginia City; just 90 minutes away.